With the Hänel Lean-Lift; we offer a high quality, high-tech lift system for warehouse organization and material procurement – saving time, storage space and costs while significantly improving work flow efficiency. The Lean-Lift can be customized to suit your exact requirements. 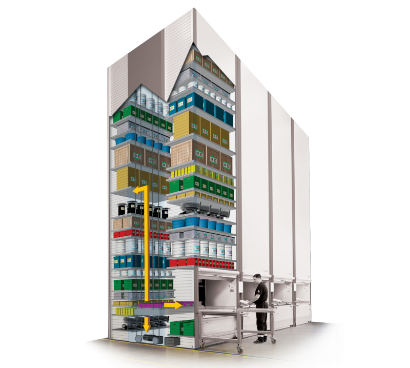 The Lean-Lift takes advantage of ceiling height – in the same was as high-bay warehouses; however, the Lean-Lift optimizes this vertical space by drastically reducing the distance between each storage shelf. This results in a 60% increase in storage capacity in the same space. The Hänel Lean-Lift reduces costs and enables space-utilization optimization. The Lean-Lift is fitted with smooth-sliding, lockable doors, protecting its contents against dirt and unauthorized access. To ensure safety for the operator during order picking, the Lean-Lift is fitted with a kill-switch, clamp protection, and proximity sensor. The delivery bay is designed to be at the optimal height which reduces unnecessary bending, ladder climbing and walking when picking or replenishing articles. The desired articles are delivered directly the ergonomic delivery bay of the Lean-Lift. The Lean-Lift is manufactured strictly in accordance with environmental regulations. Only materials that are environmentally friendly and recyclable are used in Hänel systems.